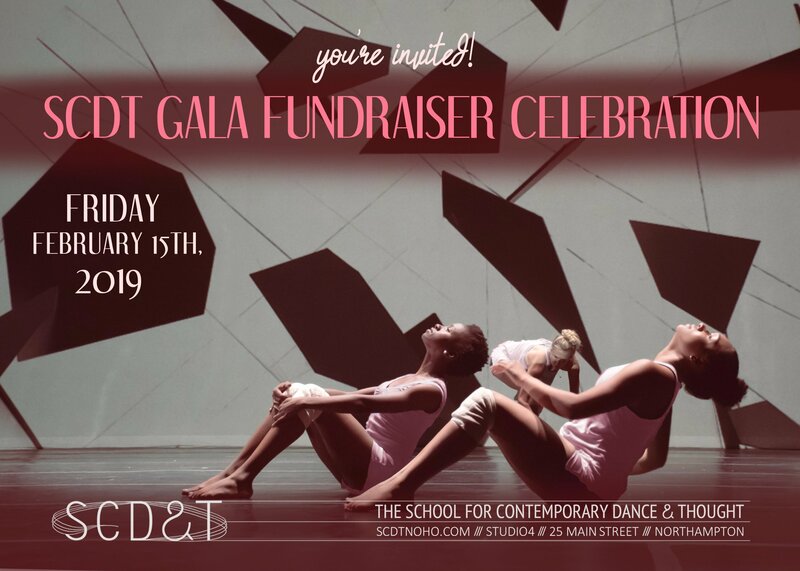 On Friday, February 15th, The School For Contemporary Dance & Thought will host its 2019 GALA to celebrate an incredible year and dance into 2019. In addition to dynamic performances featuring movement, sound, and film artists, we’ll serve drinks and food from local vendors – and we want you to be one of them! It’s been a tremendous year at SCDT. In addition to our regular slate of classes in modern, ballet, and improvisational techniques, we programmed an astounding array of high-caliber performances by internationally renowned artists – too many to list here! Please visit scdtnoho.com for a peek at our schedule past and present. – SCDT is now NON PROFIT! All donations are TAX DEDUCTIBLE! – On Sunday, January 27th, SCDT’s teen dance company HATCHERY will premiere work by Cameron Mickinney ( NYC) at the Bodies in Motion Festival. – On Saturday, February 2nd, SCDT will present the 21st HUT, with 3 NYC artists- Johathan Gonzalez, John Blum, and Lee JOHNSON. HUT has hosted over 90 regional and national artists over the past 3 years! – On Saturday, February 9th, SCDT will host an open house to introduce the MOVEMENT RESOURCE STUDIO, a studio for innovative movement therapy. – SCDT will be hosting 3 new national and international artist residencies including the Davis Project and Los Little guys. – Finally, the Gala will feature special guests, Board members Dante Brown, Wendy Woodson, Melinda Buckwalter, Smith faculty Chris Aiken, Hampshire faculty Deb Goffe, and many more! Live music from local bands! YOU GET! Business listing and logo on the SCDT website; special sponsorship notice with logo on STUDIO4’s February Events poster; representation at Gala; and special thanks at all events! If you would like to donate food or drinks to the Gala, please let us know by MONDAY JANUARY 21st. Graphics and/or logos due JANUARY 27th. Please contact Jennifer Polins at (413) 695-1799 or jenscdt@gmail.com for more information.